The Belgian sheik strikes. 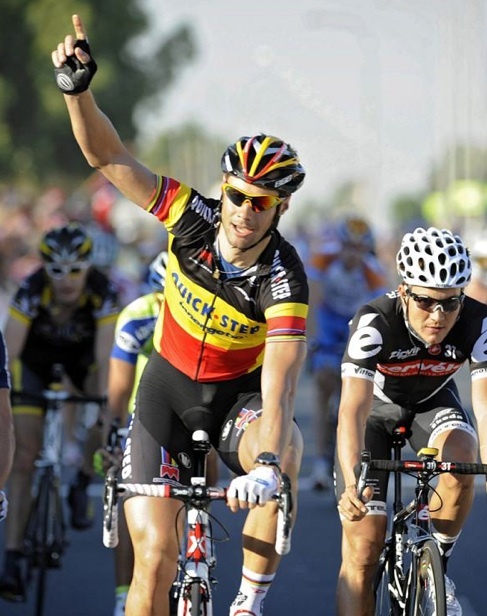 Boonen takes stage three of Tour of Qatar. 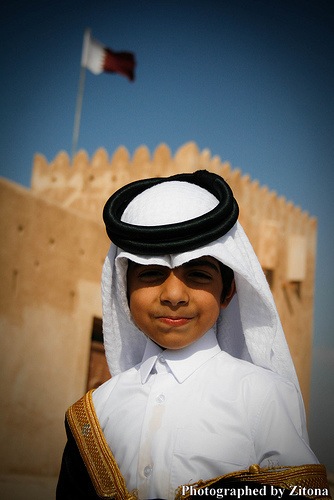 Welcome back to the Tour of Qatar, the cycling crazy Arab emirate sometimes called the Belgium of the desert. Such is their love of the two wheeled contraption. The camel may be a quaint and enduring romantic image but the reality is that bicycle racing is what enflames the passion of this Persian hotbed of cycling. During the Tour of Qatar, visitors to the capital city of Doha are sure to see hundreds of arab fans in head-dress and wearing the team jersey of their favorite squad. And make no mistake, Qatar is Quick Step country and Tom Boonen is considered an honorary Qatari. So it was with much joy and celebration that today’s 136 kilometer stage from Dukhan to Mesaieed was won by the Belgian classics star. He is the master of the cobbles and the sand dunes. Boonen went into hyper-drive to beat Heinrich (pusher man) Haussler (Cervélo TestTeam) and Baden Cooke (Saxo Bank) in a crash-filled finale. “That’s really fast! The highest I’ve ever done was against [Alessandro] Petacchi but that was with a tailwind,” said Boonen, happy to have his first win of the season. Yes, this petroleum rich country with the third largest gas reserves in the world just can’t get enough of guys in lycra racing their bikes. Perhaps this accounts for the always crowed bike shops around Shara Kharaba, the old part of town. It’s hard to keep those Marco Pantani posters in stock when every kid wants one. Crazy things happen everyday in the land of Q and Mesaieed was the scene of an unfortunate pile-up. Gerald Ciolek (Milram) joined Kurt Asle-Arvesen (Team Sky) and Steven Cozza (Garmin) in the broken collarbone competition. But the day belonged to the man the locals call El Tommeke, the Sheik. Chapeau — or as they say in Qatar, keffiyeh. « Hoohak pipe at Tour of Qatar. No, this is not doping.